As previously noted, this 25 December marks Cardinal John Foley's 25th Christmas as English-language commentator for the Pope's Midnight Mass -- invariably each year's most-watched religious broadcast across the globe. 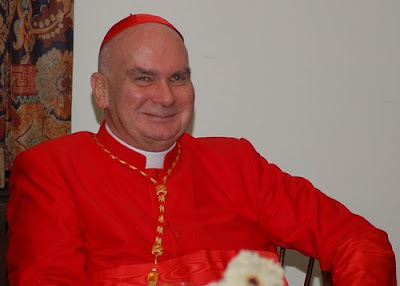 Now 73 and fresh off his first consulta as grand master of the Equestrian Order of the Holy Sepulchre of Jerusalem, the "patriarch" of the River City church began the gig in 1984 as the freshly-arrived president of the Pontifical Council for Social Communications. Alongside the worldwide TV feed that reaches well in excess of a billion viewers, the Mass is likewise aired via radio in numerous locales. Beloved by a global cult that stretches from Dubai to Darby and beyond, the Great Cursebreaker might be a man of many titles and attributes, but the most widespread of 'em all takes its root from his two hours in the booth every 24 December. In the States, Foley's "Silver Christmas" will air live-to-tape on NBC Wednesday night beginning at 11.35 Eastern. In tribute to the milestone, here's a re-run of an October post anticipating it. He might enjoy iconic status among the world's press -- both Catholic and mainstream corps alike -- but most folks simply know Cardinal John Foley as the "voice of Christmas." This year, the patriarch of Catholic Philadelphia -- who finally got to don the same color as Santa at last November's consistory (and proved to be an even bigger draw than Father Christmas on his emotional mid-December homecoming) -- will mark his 25th anniversary as the English-language commentator for the Vatican's Midnight Mass. Yet while the standing gig has made the Columbia J grad (and self-described "chocoholic") feel "like family" to not a few of the liturgy's billion-strong annual audience, the church's John Facenda recently let slip that he's had designs on hanging it up. At last month's Supreme Convention of the Knights of Columbus in Quebec, Foley noted anew that on his appointment last year as grand master of the Equestrian Order of the Holy Sepulchre of Jerusalem, the Cardinal-Secretary of State specifically requested that he keep on in the TV booth after the 72 year-old prelate indicated that he was prepared to step aside in light of his transfer from the presidency of the Pontifical Council for Social Communications, where he had served since 1984. That part had long been common knowledge. But in a new twist, the cardinal told the Quebec crowd in after-dinner remarks that, in recent months, he had informed NBC "that I was considering retiring from doing such commentary" after reaching this year's Silver Midnight. Luckily, 30 Rock would have none of it -- the network's brass "asked me to continue to be the voice of Christmas," Foley reported, "and so I will continue as long as God grants me strength." Aired across the globe, the Christmas broadcast -- invariably the most-watched event on the Vatican calendar -- is and always will be underwritten by the 1.7 million-member KofC... but without The Voice, nothing about it would ever be the same.